Why do so many children drop out of Pakistani schools? Why do retention and enrolment rates in Pakistan drop drastically beyond the primary school level? The Pakistan Education Statistics 2014-15 factsheet compiled by Alif Ailaan shows that 62 per cent of students attend government schools, but only 20pc of all government schools provide higher education. In such a scenario, private schools bridge the gap left by a shortage of government schools, but not everyone can afford a private school education, Saman Naz at Alif Ailaan tells Dawn.com over the phone. Gender disparity is also evident in school enrolment rates, with over half of all girls out of school compared to 43pc of boys. And although improvements have been made in school infrastructure, many schools do not have school buildings, while others lack buildings in satisfactory condition, as well as other basic facilities like toilets, drinking water and electricity. Of all the children enrolled in primary school in Pakistan, 69pc are retained until class 5 and only 28pc until class 10. The good news is that this is a 3pc increase from the 25pc of previous years. Enrolment and retention vary by province. Balochistan and Fata’s retention rates until class five are the lowest at 34pc and 32pc respectively, while Gilgit-Baltistan (GB) and Islamabad have the highest rates at 93pc and 92pc respectively, with a national overall of 69pc. 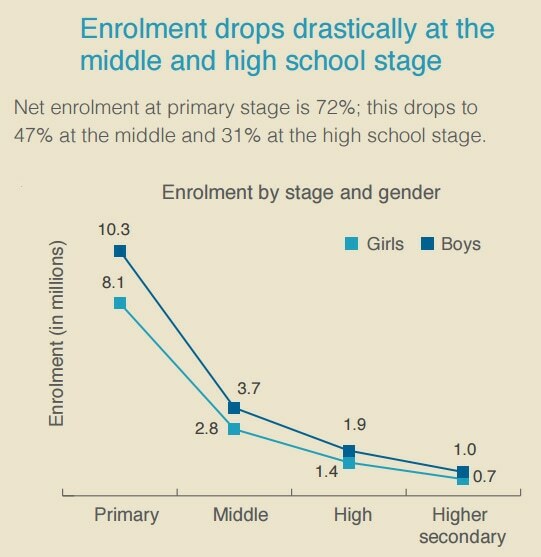 Enrolment drops drastically after the primary level, but more steeply so for girls than boys. Boys continue to outnumber girls at every stage of education. Nearly 10m boys and 8.1m girls are enrolled at the primary level; this drops to 1.9milion boys and 1.4m girls at the higher level, and just 1m boys and 700,000 girls at the higher secondary level. Although 87pc of primary schools are public schools, there is a greater proportion of private schools providing middle and higher education, at 62pc and 60pc respectively. This may be because 80pc of government schools are primary schools, while only 11pc are middle schools, 8pc high schools and 1pc higher secondary schools. The shortage of public schools at higher levels of education appears problematic as 62pc of the student population attends government schools, while about 38pc attends private schools. Nearly 24m ─ 47pc ─ of Pakistan’s estimated 51m children between the ages of five and 16 are out of school. While the dropout rate is a serious concern, enrolment remains the major challenge. Of the 24m out-of-school children, 18.6m have never attended school, while 5.4m enrolled at some point but dropped out. Balochistan has the highest proportion of out-of-school children, followed by the Federally Administered Tribal Areas (Fata). As many as 70pc of children in Balochistan and 60pc in Fata are out of school. Despite a five-year trend depicting increasing enrolment rates, many children are still out of school and more girls than boys are not in school ─ 12.8m girls remain out of school compared to 11.2m boys. Despite improvements in government school facilities, a lot remains to be accomplished, the factsheet says. About 9pc of schools operate without a school building, while 38pc operate without a building in satisfactory condition. The problem is most pronounced in Azad Jammu and Kashmir, where 31pc of government schools and an additional 29pc of single-classroom schools operate without a building. Sindh’s government schools are even worse off than Balochistan’s in this respect, with 17pc of schools operating without a building, and an additional 32pc of single-classroom schools without a building ─ in comparison to Balochistan’s 14pc and 30pc respectively in both categories. 44pc of government schools operate without electricity, 28pc without toilets and 34pc without drinking water. In light of recent attacks on schools in Pakistan, the absence of a boundary wall in 30pc of all government schools is a also a source of concern. While poor quality of teaching is regarded as one of the reasons for the high dropout rates in schools, data reveals 51pc of government school teachers have at least a Bachelor’s degree in education. 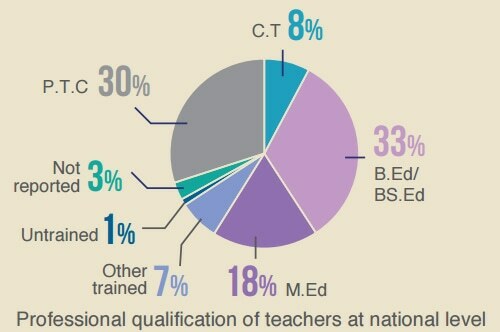 Of the 49pc who don’t have university-level degrees, 30pc have a PTC qualification, while 8pc are communal teachers. Around 7pc have received other training, while 1pc are untrained. The greatest number of single-teacher primary schools is in Balochistan, where over half of all schools have only one teacher. Balochistan is followed by Sindh, where almost half of all schools at the primary level have a single teacher. There are no single-teacher schools in Islamabad. Islamabad boasts the lowest student-teacher ratio, with 16 students for every teacher. 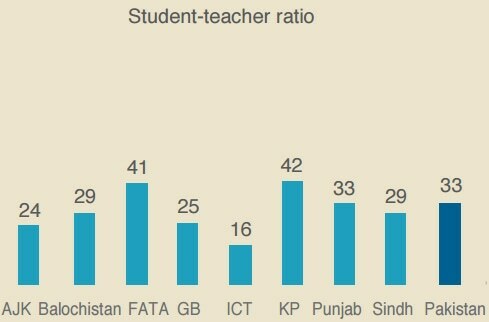 Khyber Pakhtunkhwa has the highest student-teacher ratio, with 42 students for every teacher. The average student-teacher ration in Pakistan is 33:1. Alif Ailaan, an organisation run by a team of media and strategic communications specialists, put together the Pakistan Education Statistics 2014-15 factsheet. The data presented in the factsheet was collected at a district level and compiled at the provincial and regional levels from the Annual School Census (ASC), which is regularly conducted every year by provincial and regional Education Management Information Systems (EMIS). EMIS reports published annually since 1992 provide data on key indicators. Each province/region is responsible for providing data to NEMIS for compiling ASC data at the national level, which frames the core of the Pakistan Education Statistics factsheet.